Stylish and practical, this computer desk from Bestar is a terrific focal point for any contemporary office. Colored in a beautiful red shade, this piece brings a touch of flair to any room. 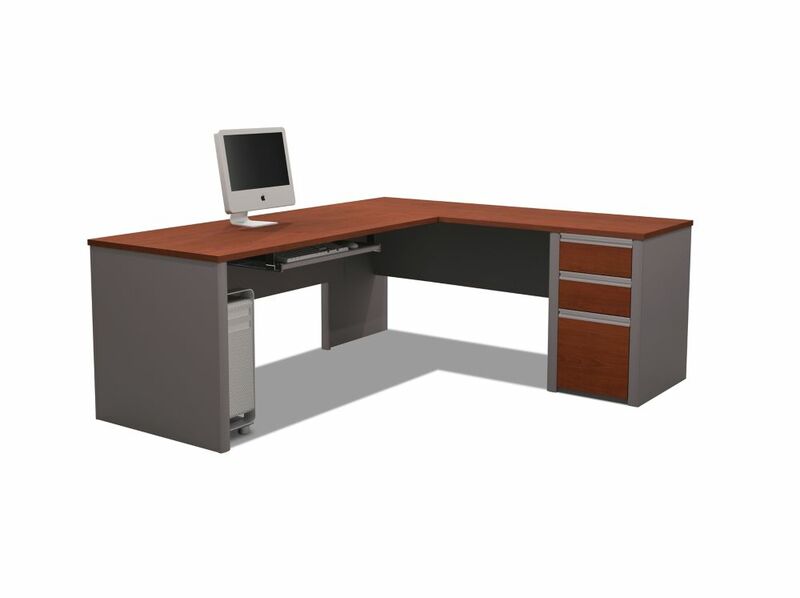 Its sturdy manufactured wood frame provides your work space with support and lasting durability. This desk provides ample workspace in its compact design for a computer, notebooks, and more. Designed in modern style and durability, this Bestar computer desk is a perfect addition to any contemporary office. Accented with a brown finish, this piece is design with thick panels and stylish lines that go with a variety of decor. Your work space will be well-supported on its sturdy manufactured wood frame. This desk provides ample workspace in its compact design for a computer, notebooks, and more. Be sure your work space has plenty of room as well as style with this modern Bestar computer desk. Accented with a maple finish, this piece is design with thick panels and stylish lines that go with a variety of decor. Its sturdy manufactured wood frame provides your work space with support and lasting durability. Keep it compact and organized with this desk, and still have enough room to store a computer, notebooks, and more. Bring organization and modern style to your work space with this classic Bestar computer desk. This stylish piece features thick panels and clear lines accented in a grey finish. Its manufactured wood frame is designed for lasting durability, providing support for years to come. Designed to keep you compact and organized, this desk is perfect for storing a computer and notebooks. Be sure your work space has plenty of room as well as style with this modern Bestar computer desk. This piece comes designed with a classic brown finish, perfect for pairing with a variety of decor. Crafted from sturdy manufactured wood, it's sure to support your work space for years to come. Designed to keep you compact and organized, this desk is perfect for storing a computer and notebooks. Connation 71.1-inch x 30.4-inch x 82.9-inch L-Shaped Computer Desk in Red Stylish and practical, this computer desk from Bestar is a terrific focal point for any contemporary office. Colored in a beautiful red shade, this piece brings a touch of flair to any room. Its sturdy manufactured wood frame provides your work space with support and lasting durability. This desk provides ample workspace in its compact design for a computer, notebooks, and more.